acrylic diamond bike ride new audience discharge flash - Hwatien Enterprise CO.,LTD. 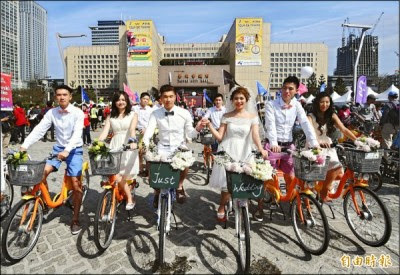 "Application ○ Yi Liu global bicycle Cities Conference" Cycling Carnival lively debut yesterday afternoon in front of the North City Plaza, about five thousand knights kinds of teams participating, there are a couple riding a self-contained "Swarovski acrylic rhinestones Bicycle "to" flash "bright marriage, became" Johnson "point field vision. Bicycle carnival in addition to bicycle getaways, Push Bike fun competitions for children, street vendors, as well as dress up floats parade Twenty-two teams enrolled, owned Swarovski acrylic diamond bike team most compelling bride and groom, the groom wearing a white dress, the bride wore white, matchmaker put red dress, the best man is white shirt with colored shorts, bridesmaids wore white tie dress, put mighty flash. Groom Tsang Kwok Chi said that he and Chang Chien Yu aromatic bride married next week, the two are Southern Giant Kaohsiung manager, are living in bicycle industry, the General Assembly would like to take the city bike, do field unique memorable wedding. He said their bikes backing is not small, the groom's car covered with blue Swarovski artificial diamond, bridal car was plastered with pink acrylic rhinestones, amounting to about 80 million, plus the body, a total of eighty 50,000. There are long motorcade ride to tandem bicycles, but the dragon balloon mounted on a helmet, ten people stepping on tandem bicycles, like a live dragon soar on the road, however, suspected due to excessive crowd, dragon team almost fell, but fortunately there are scared no insurance, adding live joy.